Sometimes bad weather happens in the heat of summer and other times in the cold of winter. No matter what the weather – these paw protectors will keep your pet’s paws ready for action and able to keep up. This 10 Best Paw Protector list is broken up into three categories: invisible protection, soft sole and hard sole elements. The whole brand of Musher’s secret is a valuable item for anyone looking to protect dogs feet prior to any activity. This is a fantastic product for the dog who doesn’t like anything on its feet. It works great in hot or cold weather, blacktop and ice/salt situations. You don’t need to be in a winter climate to use this! This is for anyone needing their soft cracked sore or tender feet to have a bit more of a tough side. This works for Humans as well as their best friend. Active Ingredients: Balsams, Peru, Tolu, Styrax, Aloe, Benzoin. It dries very quickly after put on. If you use it twice a day there might be a slight change in skin tone. It’s not ugly or permanent. Tuf foot will NOT toughen your feet to leather, only hard miles in your shoes/boots will do that, but it sure helps. Word of caution: This stuff smells! Do not apply in your house (even in the bathtub) Go outside, sit down with your feet in the air, spray it on, and let it dry. Good luck. All natural materials that will bend with the paw and stay on. It is disposable but you reuse it many times. This is a wonderful product made in the USA for all weather fun and it can assist with traction and allergies. The website states that dogs that won’t tolerate anything else on their feet will tolerate these because they can feel the ground under their paws. It’s true. These are water resistant paw protectors that have reflective Velcro straps to keep your dog warm, dry and visible to on-coming traffic. They say these are fantastic for rainy days and worthy of its name. But don’t let that be the only selling point. These are adventurous protectors – they will hold up to whatever your dog gets into. So, go for that hike or run through the snow. Make memories with these paw protectors. These are shoes that anyone can see! Multiple bright blue hues soft soles will keep your dog noticeable during the adventures in the woods. These protectors are similar to rain jackets – they have a PVC coating to give the shoes a weather proof element. These are soft, silicone sole socks that will provide traction on slippery surfaces. They are made from Cotton Spandex materials that will allow your pet’s paws to breathe while they are on. Who said you can’t mix fun with function? See the sizing chart for the proper size and price. The item selected here is medium. Adventurers need to have some color in their lives. This boot has a molded rubber bottom that comes in two colors: Red or Blue. The best part about these paw protectors is that they are machine washable. So let your dog play in the mud puddles with these waterproof protectors because you will be able to clean up the mud swiftly! Use the hard sole to your advantage during winter weather days. These paw protectors are fashionable, durable and worth every penny. The come in multiple sizes and match the current look of human boots. So, you can be twins. These are fashion forward and a practical unit for your family. These will ship from the USA. These are fantastic paw protectors that will keep your pet dry and active no matter what sport or activity you are looking to do. These are made with quality products and worth the investment. These boots look like human boots: suede-looking boot with fur lining. 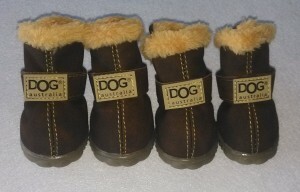 It would be easy to keep up with the family fashion with this boots. 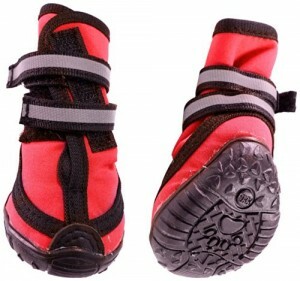 These paw protectors have elastic straps that will keep you and your dog walking safely at night. These come in multiple sizes and colors. Plenty of selection to keep your pup safe and secure during the wonderful adventures. Ultimately, it is the pet that decides what he or she will wear. However, this list of 10 Best Paw Protectors will give you options to protect their paws for years to come. It could come from invisible protection, soft sole protection or from a hard sole boot. Your pet will love these protectors especially since options can fit your lifestyle, budget and leave your house looking clean!